Waking up to the sound of bacon sizzling on the stove is the perfect alarm clock for many people. There are a variety of different ways to cook bacon; however, adding a secret ingredient that is available in every household is the key to making bacon crisp and tender, rather than dry and crumbly. America's Test Kitchen shared that adding water to the bacon while cooking ensures that it cooks perfectly every time. To make the perfect plate of bacon, place the bacon in a non-stick skillet over high heat. Add just enough water to completely cover the bacon. Adding water to the skillet keeps the cooking temperature initially low and gentle, helping the bacon to stay tender and retain its moisture. Once the water begins to boil, the temperature should be then lowered to medium. Continue to cook the bacon until all of the water has evaporated. At this point, the temperature should then be turned down to medium. Finish cooking the bacon until it is well-browned and crisp. Serve it while still warm for the perfect breakfast. Using this method to cook bacon will help reduce the likelihood of the meat becoming burnt. This is because once the water boils at 212 degrees, almost all of the fat from the bacon will be rendered, making it unlikely that the bacon will burn in the process of waiting for the fat to be cooked off. 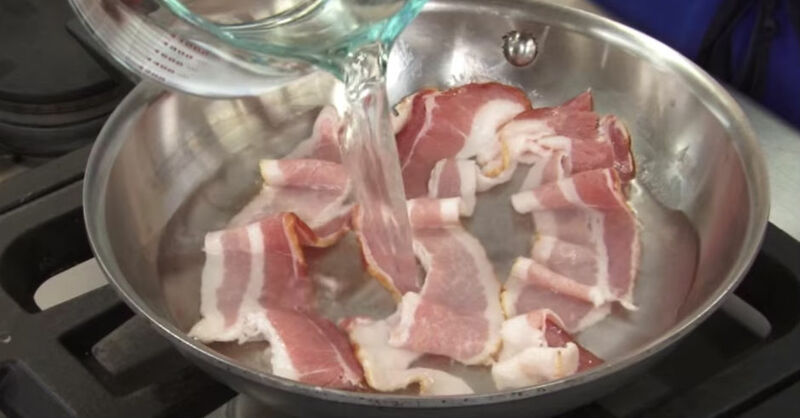 Use this tip from America's Test Kitchen tip and add water when cooking bacon to make the perfect breakfast meat every time.